Mr. Ulysses “Pete” Brown was born in Blyth California in 1948. After living in Riverside for a short time, Mr. Brown and his family moved to Lake Elsinore where he attended high school participating in a variety of sports earning eight varsity letters including the prestigious “Outstanding Athlete of The Year” award in his senior year. After high school Mr. Brown was drafted into the US Military serving as an artillery officer in Germany. Upon completion of his military service, Mr. Brown completed his education at Los Angeles State College to become a teacher at Fremont High School starting in 1960. During his eleven year tenure he coached the Tennis, Basketball and Cross Country Track teams. In 1971, the Fremont tennis team won the Southern League Title and their basketball team recorded a perfect 14-0 season record – all under Coach Pete Brown’s successful leadership. ​Later after leaving Fremont High School, Mr. Brown accepted a teaching position at Los Angeles Trade Technical College where for over twenty years he was both the tennis and wrestling coach. In 1977, his LATTC tennis team won the conference title – the school’s first for any sport in its history. After retiring in 1991, Mr. Brown continued to coach the LATTC tennis team but his real focus was on exposing, sharing and teaching the game of tennis to children – in particular to children of the inner city of Los Angeles. He worked tirelessly with junior tennis programs in the area taking care of the players making sure they had equipment, training, a way to get to tournaments and whatever else they needed to perform and excel at the game of tennis. This commitment is what laid the foundation to what the Peter Brown Junior Tennis Program is all about today. Mr. Brown passed away in 2009 and is survived by his wife Theresa of fifty five years and their two daughters Terry Lynn and Vanessa Ann who continue to generously support the program their father helped create. ​During his career as an educator and coach Mr. Brown was recognized with many prestigious awards including the following: Martin Luther King Community Service Award; the USTA / USPTA Community Service Award; CA Community College Tennis Coach of the Year; Outstanding Teacher of the Year; Congressional Tribute and Award for Lifetime Achievement of Community Service; Southern CA Tennis Association Lifetime Achievement Award; CA Community College Tennis Hall of Fame Inductee; Southern League Connection Honoree – Lifetime Achievement Award. In addition Mr. Brown was a member of the USTA, USPTA, US Professional Tennis Registry, a USRSA Certified Stringer, on the SCTA Board of Directors, SCTA Junior Tennis Council and SCTA Sportsmanship & Grievance Committee. Our board members, coaches and family supporters help lead the PBJTP. Mr. Marty Woods and Ms. Delores Simmons, as board members, work tirelessly both on and off the court to make certain the PBJTP is successful in everything it does. Mrs. Theresa Brown, Pete’s wife of 55 years, and Ms. Terry Brown, Pete’s daughter, continue to support the great work that Pete started for which we are most grateful. We offer free weekly supervised on-court tennis coaching and training to children at all levels from ages 5 to 18. All equipment is provided including tennis rackets and balls. Children do need to wear tennis shoes on the courts. If a child shows up to play without shoes we will help he or she get a pair so no one is ever left out. Our seasoned players are in need of excellent practice and coaching so they will advance to the next level of play. Weekly drills, instruction and match play propels our players and readies them for USTA and local tennis tournaments. We strive to provide these players with the skills they need to be winners. Our coaches honor the late Mr. Brown by continuing to develop multi-diverse youth into competitive players, more importantly our coaches are mentors and role models emphasizing the importance of hard work, determination and perseverance. PBJTP coaches provide life lessons and skills for both on and off the court. We incorporate Academic Creative Engagement (ACE) in to our program which is designed to encourage academic achievement, health / wellness and social / emotional skills which guide children in their daily lives. Combined with tennis we are in harmony with Arthur Ashe’s vision of developing the “whole” child in a loving environment. Working closely with USTA and NJTL programs, we seek to develop our junior players and their athletic abilities toward the sport of tennis starting at an early age. We also stress the importance of character, integrity and sportsmanship – ideals that were critically important to Mr. Brown and his family. PBJTP is all about having fun. During the year our children get to play at other venues including private clubs and major universities. Also, we host various tennis related events including the Frank Simmons New Year’s Day Tourny (January), the Living Legends of Our Tennis Community (February), the Pete Brown Level 5 Tournament (May) and the LaRhonda Amos Children’s Holiday Celebration (December). PBJTP at Harvard Tennis Park ​ is home to a wonderful community of supporting families who believe and see the uplifting results of the PBJTP. They are always available to volunteer their time to help on the court, to take time to mentor and tutor the children as well as participate and help manage the many special events we conduct throughout the year. Our community volunteers are priceless and are an integral component of PBJTP’s success. 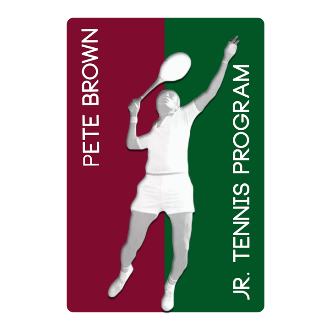 ​The Pete Brown Junior Tennis Program (PBJTP) is a 5013c organization in honor of Coach Pete Brown who for forty plus years shared, taught and spread his love for the game of tennis to inner city youth of South Central Los Angeles. After his passing in 2009, the PBJTP was formed to continue his mission of providing a safe and positive place for young people who have the desire to learn and excel at the game of tennis. Based at Harvard Tennis Park, we have eight tennis courts available to us. We offer after-school and weekend tennis, academic and mentoring programs at no charge to children who are willing to work hard in school and on the tennis court. We help our children reach their full potential and use their PBJTP experience to help them go to college, earn a degree which is essential for future success. Your contribution will change a child’s life and will help set the foundation for a healthy and active lifestyle that will last a lifetime. We are dedicated to training diverse community youth in grades pre-K through 12th grade the sport of tennis. Our emphasis is on developing physical fitness, sportsmanship, team work and education. PBJTP strives to provide the opportunity for children to develop into competitive tennis athletes, build self-esteem, personal confidence, lasting friendships and great memories all while having fun.